Saturday:- Borrowdale. English Championship. Thanks to the many representing, I seem to have avoided several runners at the Sty Head Cafe . Right to congratulate the Ladies, 2nd Team and similar? For the Vets Team? Judith was first in her category, Nicky walked out for something. And suggest that all the men's teams are banking on Langdale - to be hoped that everybody and everybody has got their entry in....Rhys was 5th, Nell was 13th, Spyke wax 3rd V50 (in a rather competitive age group..) andKeith in the prizes. Just a bit chilly if ever you were waiting around, but clear and dry. Two weeks now until the next English, Pendleton Three Peaks. Denis Stitt Memorial - results. Summer Series 10 - Hurkling Howler. Carshare is upgrading, eventually , to Windows 10, so it's some reduced contribution just now, until I gets my computer back. No doubt our Webmaster can deal with any pressing urgencies. The team results are on the FRA website, under Events, and then Championships. Or Here , for the British. (The link might be working this time...). The individual results seem to have wandered.. Senior Men and MV 50 are Champions, the MV40 need to deliver in Scotland. Congratulations to Tom Saville, MU23 Champion. When all the results emerge, they can have a better prominence. The final race, Merrick, in September, will find people getting their last counter in, or dropping a weak result, so far too soon to be banking on some excellent current positions being maintained. Borrowdale - isn't far off, and is English Championships. Substitutions are allowed on the day, so please let us all know if you are sitting on an unwanted entry..
Holme Moss. Once again, Holmfirth reminded us how to be putting on an excellent race. The legacy, no doubt, of previous organiser Russell Bangham. Seven pounds, free drinks and top class food afterwards, and lots of prizes throughout all the categories. As for the race, it don't get any easier as each year passes. The boggy bits were deep, but mostly the peat was dry and the rocks not slippy. It is so much harder now that we return on the outrun, whereas once we dropped off Holme Moss road to the dams and legged it in. Does someone have an accurate distance measured? It seemed a long, long way.. Kris Groom has it as 28.6km, with 1106m climb. Kentmere - results. a goodly set of travellers here, some most welcome new,(to me), faces. Clear, hot lower down but windy and a bit colder higher up. This is the 42nd time that Pete Bland, and his wife, have organised this race, and now he is stepping down. So many of us owe him a great deal for his contribution to this race, and many others. Another remarkable achievement was that the first winner of the race, Jeff Norman, was here running, now being 1st V70. English and British Championships after Sedbergh. Full results are on the FRA website, then Events, then Championships. Senior Men:- Rhys - 2nd : Neil - 3rd: Tom Saville - 7th. MV40:- Spyke - 3rd : Dave Taylor -6th. Men's Team:- 1st - 3rd at Sedbergh. MV50 Team:- 1st - 1st at Sedbergh. U23:- Anna Hoogkamer - 2nd: Ellie - 3rd. V40:- Judith - 7th : Helen - 8th. U23:-Tom - 1st : Matthew Elkington - 2nd. V 45 :- Spyke - 3rd : Dave Taylor - 9th. V50:- Spyke - 2nd : Steve - 4th : Dave Taylor - 5th. On a most quick calculation, for the Men, Pudsey are 1st, Keswick - 2nd and us - 3rd. Ladies - Mercia- 1st , Helm Hill - 2nd , Calder Valley - 3rd and us 4th. Rob Little, clearly much more statistically able, thinks:- "regards the British, by my calculation the senior men now can't be beaten (2 wins and a 3rd=32 points, best P&B or Keswick can get is 30 even if they win Merrick). Not a clue about the Vets, but that looks like 1st MV50 Team, and thus British Champions. These results don't show the 5 year categories, so that will have to wait. A very worthy Championship course. Rain always around, and although windy, not that cold. A lap around the field to thin the race down, into a long road bit out onto the fell. Two strong climbs, then a steep slithery, slidy descent into the finishing fields. Wasdale. results . Not the best of conditions, with 40 retirements. A very strong team result from Ambleside. John Hunt sends:- "It was wild even by Lakes standards, awesome, the forecast was bang on." Charlesworth and Chisworth - any results most welcome, not sure we ever found last years..
Tom's Bransdale Race - N.Y.Moors. Golden Acre Park Relays - another extremely popular relay, teams of three, around this Leeds park. An event putting on a relay for all abilities. results. Blackfell:- results - is a completely excellent AM course from Kettlewell, well worthy of Championship status. Regrettably there were only 24 runners, such a shame for the organisers and marshals. Hopefully many of us can get along next year. Plenty of rough stuff over the back of Great Whernside, then a last part across to Hag Dyke, where anyone finding any correct line would have thrived. Tom Brunt, 2nd,, Ashley, 1st V50, and Greg removed the Team Prize, so a need to be retaining that next year. Round Sheffield Run - results. Danefield Relay - around Otley Chevin. Teams of 3. :- a very popular event , teams of 3, with each lap about 5km, and a big uphill finish. The six races have been completed, with the best four to count. Thanks to everyone turning up to represent. U18 Boys - Jack Crownshaw - 7th (4 races). Buttermere Horseshoe. This year a counter for the Lakeland Classics, and also the Carshare League. results. With taking the first three places, a clear win for Borrowdale, but 2nd will be useful Lakeland Classics points. Wharfedale 2 or 3 Peaks:- results. Much like "Grin and Bear it", for the local Mountain Rescue, around Buckden Pike and Great Whernside. Only two peaks for Carshare, quite far enough. But hoping Willy never finds out, there was a most crafty recce of secret lines off Great Whernside. So when the final Carshare League race rolls around, might Carshare be hurtling past, whilst others are wading through the boggy swamps? High Cup Nick - results have finally emerged..
Clougha Pike - English Junior Championships results. - Keith mentions that Eve "is English Uphill only champion, English Schools U14Girls champion, English Fell running Champion, Yorkshire U16 Girls Champion and is now in both Yorkshire and English Team - not a bad year for her so far!" Settle Hills - results. One of the much better Medium races, starting from Settle market square, and previously used as an Inter-Counties course. A long sharp uphill, then to scenically roll around Attermire Scar, with a good mixture of ups and downs, mixed with ample rough stuff across some grassy bits. Summer Series 6 - Black Tour. Pontesbury - (Shropshire..) - results. Not long now until AS Sedbergh Sports, 9th July. A crunch need to be getting there in full strength and depth, as other individuals and teams can do a whole load of overtaking in the last two British events, and it is also an English Championship. The Howgill website has a map, etc, and entry details if you've not yet registered. Senior Men:- Rhys - 1st : Neil - 5th : Tom Saville - 6th. MV40:- Spyke - 2nd : Dave Taylor - 5th. MV50:- three on equal 1st - Spyke, Dave Taylor and Mark Roberts. Men's Team:- 1st - 1st at Cwm Pennant. MV40 Team:- 1st - 1st at Cwm Pennant. MV50 Team:- 1st - 1st at Cwm Pennant. Cwm Pennant:- British Championship 2. and also Carshare League. - results . Howtown:- results. one of the gems of fellrunning, and only £3.00 for a class AL race. Surprisingly, conditions were perfect, cloudy but clear, very warm. A wander over Loadpot Hill, High Raise, Place Fell, with a nasty sting-in-the-tail up and down Hallin Fell. Monday - Summer Series 5. Rowlee Zig-Zag. Angela Mudge Interview - a link is here to a Radio 4 program from Monday. Hutton Roof - good if you're up that way... results. Helvellyn and the Dodds:- results,dry, hot and sunny up there. And there aren't that many streams to be crossing, so for many runners it seems to have been hard going. But not for the winner, Carl Bell, with a new record. 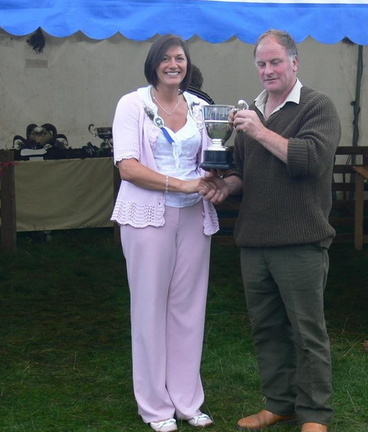 The organiser, Allan Buckley, has been doing this race, and its earlier version from Bram Crag Farm, from time hardly remembered, and it has always been a classic event, so a big thanks to him for many years of committment, now that he is passing it on. World Youth Cup Trial - at Sedbergh, up Arant Haw .results. Excalibur - Don't know what this is, looks like a marathon distance over the Clwydian Hills. West Nab:- Yorkshire U23 and English U20 Championships. results. Ellie Crownshaw 2nd U20 female - English silver medal as 1 off competition. Dark peak men - 1st Team - Tom, Austin + Kev. So every Dark Peak member who took part won something!" Batch Bash - Church Stretton:- results. Very many congratulation to Nicky on this magnificent double BG , 45hrs 30 mins. We must now await a suitable response from Roger? Fairfield:- results . Hot and sunny down below, clear and a lot colder high up. A group of old men lined up,(apologies to Craig, never met up with you..) with Jenny for the Ladies. We now need to keep left of the wall dropping off Dove Crag, it didn't seem to make much difference? Worth remembering that the most thorough Ambleside kit check takes time, and best not to be last minuting. English Championships after "Up The Nab"
U23:- Ellie - 3rd : Anna Hoogkamer - 2nd. V40:- Judith - 7th= : Nicky - 9th=. V45:- Judith - 4th= : Nicky - 6th= : Pippa - 10th=. Seniors Team:- 6th - 3rd at "Up the Nab"
V40 Team:- 5th - 1st at "Up the Nab"
Seniors Team:- 2nd (on countback to Keswick) - 2nd at "Up the Nab"
V50 Team:- 1st - 1st at "Up the Nab"
"Up the Nab - English AS Championship. A much better course than I'd been expecting. Not any big hill, but five strong climbs, some just runnable and some right steep. A good mixture of stuff to be descending on. Warm and dry. Good to see so many people representing, but then it is a nearly local race, and to be hoped this committment can be applied to the other important events throughout the year. Not sure much of who did what. Judith and Nicky walked out for prizes, and it should be a 1st for the Ladies, which should also mean the LVets. Keswick, clearly getting their act together, look to have taken, just, the Men's Team, with us 2nd?. not any idea about the other teams. The organiser of the Howtown race scheduled for Sunday 12th June has with regret, cancelled the race"
Summer Series 3 - Way Out West. Lose Hill - Uphill only. Tour de Yorkshire - begins on Friday : Beverley to Skipton : Saturday is Otley (the capital of Yorkshire Cycling) to Doncaster, and Sunday is Middlesborough to Scarborough. Coniston:- dire conditions yesterday had put the race in jeopardy, but a safe compromise was worked out to avoid the drop off Coniston Old Man, which is slippy at the best of times. From Swirl Hawse we dropped to Levers Water, and then across to join the usual descent route. Plenty of snow around, filling in the holes between lumps of rock, so every opportunity to crash badly. Results . Some big effort from Jasmin. with a 15hr 23min BG. Big effort indeed! Summer Series 2 - Broomhead Bash. Donard-Commedagh Horseshoe - results .British Championship 1. Big apologies to ignoring Tom Saville, being 1st U23, and this being in a very strong grouping indeed! The expected stuff from Ireland, hard, steep, plenty to be slipping on, and had the clag been down, plenty to be getting lost in. Donard/Commedagh has oft been a Championship course, but an extra loop this year stepped it up a good notch. Start at sea level, climb to nearly 3000ft, and plenty more to come. Threatened bad weather never came, so clear, cold, a bit of snow on the top. Rhys was 3rd, right close to Rob Hope and Sam Tosh at the finish. But crucially the others packed in tight, Neil, Tom Saville, Rob and Dave Taylor. I'm presuming that gives 1st Team. Now for a special mention for Keith. Dave Taylor, 1st V50, and Spyke - 2nd V50, superb, but the Team needs three, and it's that last counter which is so important. Keith, as one would expect, delivered the goods, and I'm told it was 1st MV50 team. But the MV40 were effectively one short, Mike Nolan coming also well up. But maybe? 3rd? So please can loads of others consider getting these entries in, to add that crunch depth to the teams. Carshare wasn't last but not so many behind me. An excellent weekend, and hope that many more will make plans for next year, most likely to be their AS course. Eskdale Elevation - some excellent looking event from Boot, wandering up and around Scafell. Rhys sends:- "New race in deepest Eskdale (run by our friends across the Peak). Start and Finish in Boot, and take any line between Whin Rigg, Sca Fell summit and Eel Tarn. Excellent course, lots of rough ground. Yours truly took the honours (and a rubbish new record) in thick clag, wind and rain (or spring as we call it up here). Unfortunately the other Brown Vest in attendance had a bad fall on Whin Rigg and got Mountain Rescued - best wishes to Joe Blackett for a speedy recovery." Northern Road Relays - 12 legs, up in Sunderland. A look at the results shows Hallamshire as finishing 7th, with Salford home first. Three Cabins Challenge:- DPFR event. Blubberhouses Moor - a very good long, mostly runnable trip around Wharfedale, very arduous later on.